Behind every great pressroom is a great toolroom, equipped and staffed to move new dies from the design center efficiently through production, and to also return production dies requiring maintenance back to the presses in a timely manner. Toolrooms also are tasked with supporting assembly and welding operations, by manufacturing jigs and fixtures.We interviewed managers at three metalforming companies to learn how each is equipping its toolrooms to be the perfect partners to their production-manufacturing operations. Part 1 of 3. This isn’t a car magazine, so I don’t get to test-drive the flashy new models that lit up the stage at the Detroit auto show—models like the recently introduced Camaro convertible. So rather than being part of the media frenzy surrounding that particular car, and typing up flashy prose describing its teeth-rattling performance and wind-in-your-hair exuberance, I decided to trace some of the behind-the-scenes manufacturing excellence that has made this dream car a reality. My Camaro-manufacturing journey took me to a metal stamper known primarily for providing fineblanked throttle plates, lock hardware and similar parts which, virtually overnight, morphed into becoming the sole manufacturer of completely assembled hardware systems for the convertible top on the new Camaro. “As the Tier Two supplier to Magna for the convertible-top’s steel substructure, we’re busy running 28 new dies and assembling 41 parts in all, including bushing insertion, riveting, welding and tapping,” says Principal Manufacturing toolroom manager John Brazzale. I managed to hit the plant’s production floor (in Broadview, IL) during launch week for the Camaro convertible project, so it’s newly outfitted assembly room, where all of the stampings, fasteners et al come together, was teeming with activity. What I missed, of course, was the flurry of toolroom activity over the last several months that brought the company to this point. 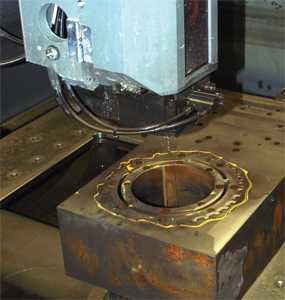 A Fadal vertical-machining center makes quick work machining a die block in the Principal Mfg. toolroom. The Camaro project now has the pressroom and assembly room at Principal Mfg. turning out 1100 complete units/week—by anyone’s calculations, that’s a lot of stampings and assembly time. Success on a project of this scope only came thanks to the company’s continuous improvements made in its toolroom over recent years—to its die-build procedures, as well as the addition of new CNC wire-EDM machines. The Mitsubishi FA-20S offers x-y-z axis travel of 19.7 by 13.8 by 11.8 in., and maximum size of 41.3 by 31.5 by 11.6 in. Features include 16-step programmable flushing control, 3D graphical programming, a digital 500-W AC servo-drive system and the ability to make large tapers—45 deg. per side when using special guides, flush cups and Mitsubishi’s Angle Master option. Wire-EDM work on the firm’s newest machines from Mitsubishi has become at least 15 percent more efficient thanks to state-of-the-art technology. and flushing pressure are automatically adapted for the processing conditions, optimizing the cutting speed and minimizing the risk of wire break at the same time. This decreases throughput time and permanently reduces operating costs. 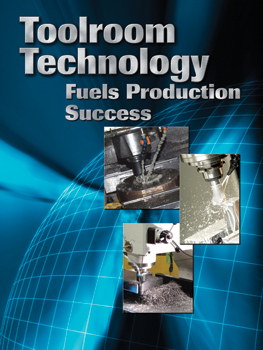 “A further highlight is the Technology Master function, which automatically ensures that the processing of complex workpieces, with differing thickness or with longer distances to the lower flushing nozzle, is performed with ultimate precision. To Principal Mfg., this translates into faster production, speed to market, expanded capacity and the ability to meet the requirements of game-changing contracts like the Camaro job entrusted to it by Magna. 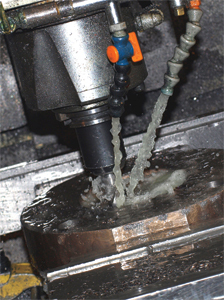 Another move made in the toolroom to quicken speed to market was moving some work a from sinker EDM and to CNC hard milling with carbide cutters. Specifically, the toolroom now hard mills most of its stinger rings—impingement rings found on most fineblanking tools to control material flow during forming. Machining the rings cuts processing time in half, and in the pressroom the tools last 30 percent longer between maintenance cycles. The assembly room at Principal Mfg. dedicated to building the substructure for the Camaro convertible top includes dozens of new assembly fixtures and jigs, like the one shown here. The firm builds standard fineblanking die sets to 26 in. square, 3.5 in. thick top and bottom. Of its 300 employees, 24 toil in the toolroom.